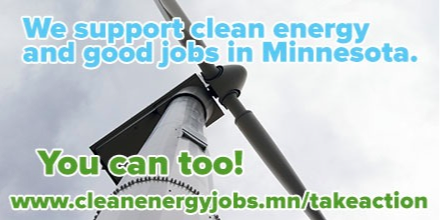 The Minnesota Clean Energy & Jobs Campaign is labor, faith, youth, community, and environmental leaders who have joined together to support a responsible Minnesota Clean Energy Plan. A responsible clean energy plan will create good jobs, preserve our four seasons and our outdoor heritage, and save us money in the long run. Send a letter to your State Senator and State Representative today urging them to support this plan that will build on our state’s successes and ensure we tap our state’s clean energy potential. Improve the existing Renewable Energy Standard to 40 percent by 2030. Right now, we get 15 percent of our energy from renewables, but we’re only using 1 percent of our wind potential. Improving the RES to 40 percent by 2030 will help save money in the long-run, create family-sustaining jobs here in our state—especially in Greater Minnesota—and is the right thing to do for our future. Improve the yearly energy savings goal for utilities from 1.5 percent to 2 percent. This goal is already saving enough energy to power more than 100,000 homes. Improving it will create good jobs in construction and manufacturing and save money for families and businesses in the long run. We support the Minnesota Clean Energy & Jobs Campaign’s efforts to enact a responsible Minnesota-based clean energy plan. The plan will save money for Minnesota families and businesses, it will create good jobs, and it will protect our Minnesota’s Great Outdoors for our children and grandchildren. You can lend your support by writing a letter to your lawmakers. Click below to take action and send your letter.